Dr. Gustavo Carvalho has a Ph.D. in Political Science from the University of Toronto, an M.A. in International Relations from the Catholic University of Rio de Janeiro, and a law degree from the Federal University of Rio de Janeiro. 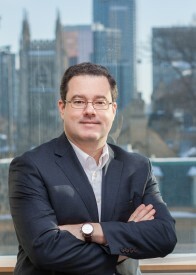 Prior to his move to Canada, Gustavo worked as an in-house legal counsel for a Brazilian hedge fund. His dissertation was titled “International Structure, Cooperation, and Sovereign Debt Crises: the Brazilian Debt Restructurings of 1898, 1931, and 1983”. His research for IMFG will analyze and compare different climate financing instruments that can be applied by Toronto and other Canadian cities to help fund climate mitigation and climate adaptation projects.